The latest version of Parallels Desktop 13 for Mac will include initial support for macOS 10.13 High Sierra as both the host and guest operating systems when they are released later this year. Parallels warns that an update for the software may be required after Apple makes the operating system available to download to the general public. A key addition to the software this time is support for the Touch Bar, which can be used with Parallels Desktop itself, with a Touch Bar Wizard allowing users to customize how it works within Windows and various Windows applications. Another Mac hardware integration introduced in this version is the ability to protect the application's preferences and virtual machine configuration with Touch ID, with a fingerprint needed to make changes to the settings. Initial support for the Windows 10 Fall Creators Update is included, though just as with High Sierra, users may have to update the application to gain full support after the Windows update's release. 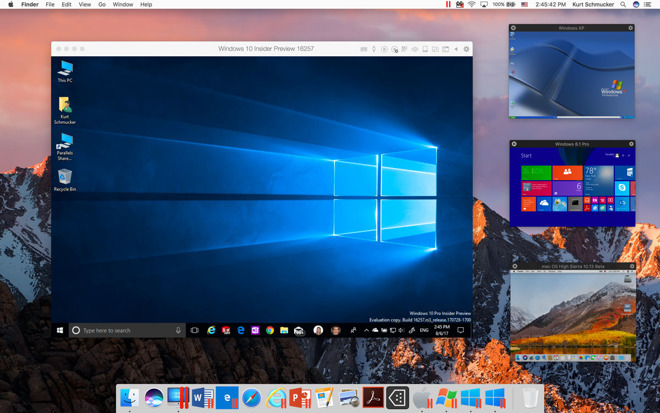 To simplify the setup process, Parallels Desktop will help users download and install Windows 10 within a few clicks, if they do not have the operating system installed, while the process of transferring a Windows PC to a virtual machine on a Mac has also been improved. 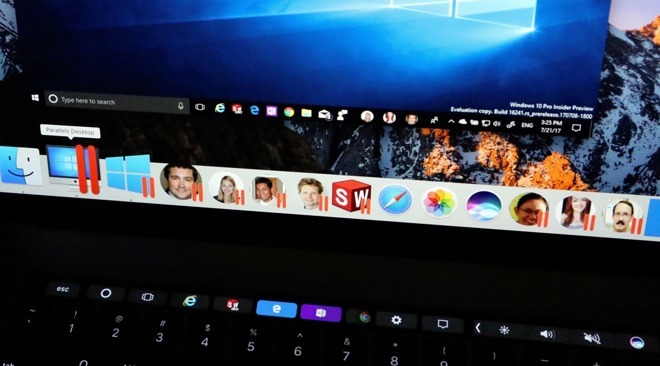 Extended support for the Windows 10 People Bar now allows users to pin as many people as they wish to the macOS Dock, as well as to communicate with people on the bar from the macOS Dock, Finder, and Spotlight. When Windows is running in Coherence mode, it is also possible to manage the People Bar from the macOS menu bar. The new Picture-in-Picture view mode displays the virtual machine in a small window, which becomes transparent when the user switches to another window. It is possible to show the virtual machine window on all Spaces and on top of other windows, while the close button in this mode switches the virtual machine back to the window view mode rather than shutting down the virtual machine, to help prevent any unintended data loss. Parallels Desktop 13 for Mac is touted as being much faster than the previous version when using Windows files, with the virtual machine claimed to be up to 20 percent faster when used within MacOS with an SSD, while performance with mechanical hard drives is said to be up to 40 percent faster. Working with Windows files from within a Windows installation is also said to be up to 57 percent faster than the preceding version when the virtual machine is on a hard drive. Parallels is continuing to work on OpenGL 3.0 support, with an update to Parallels Desktop 12 allowing it to handle graphics-heavy games including "Rage," "Wolfenstein: The New Order," and "Wolfenstein: The Old Blood." In this release, support for light design and planning tool DIALux evo and strategy game "Northgard" have been included. The way Parallels handles higher-resolution displays has been updated with a new "scaled" mode, making icons and text in the hosted operating system appear clearer in Retina displays. Dynamic resolution support also makes it easier for users to change the size of Windows, including quick changing of resolutions, and faster booting and rebooting speeds also touted. Users of the Pro Edition of the software are able to use up to 128 gigabytes of memory per virtual machine, with support for up to 32 virtual CPUs. Standard edition users are limited to 4 virtual CPUs and 8GB of memory per virtual machine. These speed improvements also apply to files on external storage, with usage of files on a Thunderbolt-collected SSD up to twice as fast as in the previous version of the software, and a 40 percent speed increase for working with files on USB 3.0 storage is also claimed. The process of creating virtual machine snapshots is now up to 50 percent faster than in version 12. Just as with last year's Parallels Desktop 12 release, version 13 includes Parallels Toolbox for Mac and Windows, a collection of tools to maintain and simplify an assortment of tasks in both operating systems. This collection is included free for owners of Parallels Desktop 13, though it can also be acquired separately on a $9.99 annual subscription. Parallels Desktop 13 is available now from the Parallels online store, with the Standard edition selling for $79.99, or $49.99 as an upgrade from Parallels 11 or 12. Parallels Desktop Pro Edition is sold on a $99.99 annual subscription, discounted to $49.99 to existing Parallels 12 or 13 users. Any Mac running macOS High Sierra 10.13, macOS Sierra 10.12 or later, OS X El Capitan 10.11.5 or later, or OS X Yosemite 10.10.5 or later can run Parallels, according to the company's system requirements. While 4 gigabytes of memory is required, 8 gigabytes is recommended, as well as 850 megabytes of storage for the installation, and additional disk space for the virtual machines.